Should Golfers Have to Pass an Etiquette Test? A story found while searching Google News stated that nine out of ten greenskeepers believed that players should pass an etiquette test before playing golf. Ninety-one percent of players, as reported by Today's Golfer, leave a golf course in an "inappropriate state", from not repairing divots and ball marks to a basic lack of course management practices. This lack of golf course etiquette translates even further to a lack of courtesy within the social structure of the group affecting both the spirit and integrity of the game. This timely article sent to me (below) struck a nerve at the heart of golf courses and players worldwide. It is with pleasure that I use it as a Spring reminder as a new season of golf is in the air. Enjoy! David Bryce is an online publisher for Golf in Branson, MO at Thousand Hills. He blogs on the topics of golf, travel, and vacations and enjoys staying at Thousand Hills cabins in Branson. Thanks to David for submitting this fundamental guide to golf etiquette. Picture a football game, a soccer match, a tennis match up or even basketball tournament. What do all of these sports have in common besides extremely impassioned fans? All of these sports make use of some kind of referee. Golf, while still just as much of a sport as the previously mentioned entries, has long gone without the direct oversight of a referee. This is because the game of golf lends itself heavily from the idea of the individual holding themselves accountable for their actions, adherence to the rules and yes, how they treat others before, during and after the game. Before you tee-off, golf better practices would be to take a moment to look around to make sure that you won’t be obstructing anyone else’s game. Look ahead to make sure no one is in front of you and in the same manner of thinking, be aware of the golfers behind you. Tee times are often flexible on courses, but spending too much time on one hole can disrupt a whole day of careful planning. I always like to equate the golf green to the inside of a library. It has become common courtesy over the years to be as quiet as possible while playing your round. At approach, golfer’s require an immense amount of concentration and focus before they take their shot. Being distracted by loud talking, yelling or laughing can throw off someone’s swing and perhaps lead to a stern talking to from course managers. Also (from GFB), either set your cellphone to vibrate or just plain turn it off! Launching your golf ball into a sand trap is just a natural part of the game; frustrating indeed, but that is what they are there for. After you take your chip shot, make use of those tiny rakes that are situated around the bunker and smooth out the irregularities you’ve made with your swing and steps as your approached it. It’s common courtesy to leave the sand in the same condition that you found it. Repairing your divots after a shot is synonymous with good golf etiquette. No golfer wants to be playing a hole only to find themselves tripping and stumbling over someone else’s mess they failed to clean up. After you take your shot, take the few moments necessary to find your divot and then, replace it. A lot of work goes into the design and maintenance of a golf course. Do you part to keep the course you play on looking great for your future games and the future games of others. The player line is a golf term that signifies the imaginary line between the player’s ball and the hole. If you are on the green and notice that your ball might be in the way of another player’s ball, take a moment to switch it out with a coin or a ball marker as not to get in the way of their game. When the way looks clear, go ahead and replace the marker with your ball and proceed with your game. The rule holds true for shots taken on the putting green and on the rest of the course. Be courteous to and vigilant of those around you! Would You Sport This Putter Cover on the Golf Course? When golf fans deliberate about The Masters, it's usually with an eye on statistics but how many times is the term "fashion statement" used? From Tiger Woods' golf clothes to Esquire's Best and Worst Dressed at The Masters list, style has become almost as important as the game. Yes, The Masters Green Jacket is safe from both remodel and extinction but designers have decided that, since the jacket remains green, maybe an azalea pattern is needed to go with it? Rickie Fowler sports neon, Phil Mickelson looks groovy his now regular pinstripe attire, Tiger Woods' red shirts make a statement on Sunday and the ever vivacious Ian Poulter with his brightly striped plaid pants...is, well, always a fashion statement...with an exclamation point! Golf course fashion is becoming de rigueur and accessories from belts to shoes are now par for the course. Poulter's company, IJP Designs, has decided that, in addition to his clothes looking ever so fashionable, so should the accessories, hence his newly created Azalea Jacket Limited Edition Putter Cover (see below). Blade and mallet styles will be available in limited supplies. IJP Designs has created three additional putter covers to mark all four major tournaments. Wonder what we'll see for the U.S. Open? What do you think? Is this putter cover something you would sport on the golf course? Voice your opinion on Twitter @Golf4Beginners and on Facebook. My readers may already be familiar with my personal and professional progression as it relates to golf and the internet; how my blog and Golf for Beginners brand has evolved over ten years through the use of social media and collaboration. It is because of my social media presence that I have been asked by IBM to partner with them on their new Smarter Commerce Campaign, becoming one of the "faces" of this new technology platform and helping them to define what smarter commerce means to me and you. This month I have been requested to share my consumer-centric story with you, my audience, through social media channels like Twitter, Facebook, Instagram, Pinterest and through this blog using the hashtag #MYSMARTERCOMMERCE. This means, if I tag a post, blog or picture with the hashtag #MySmarterCommerce, it is so that I can share how my life has been impacted by technology, society or maybe it's just something that I happened upon in my daily grind. I hope that, when you see me using this hashtag, you will consider continuing the conversation with me and let me know how something you saw or did during your day has changed the way you do business! Throughout February, IBM will have a running feed highlighting all tweets with the hashtag #MySmarterCommerce and, at the end of the month, all content created will be compiled into one social story. How does technology play a role in our lives? How do we network and grow both personally and as connected consumers? Do we know what other businesses think about our brand? To tell you the truth, even I don't know where this is going yet but...I'm sure to enjoy the ride! I hope that, as I help IBM define what smarter commerce means to me, in turn, I'll learn more about your personal stories of brand building and how social media, digital and mobile technology has helped you grow both personally and on a professional level. I will be sharing a 'day in my life' with you to create a "think-tank" of sorts and I invite you today to take this journey with me. Is Tiger Woods, Phil Mickelson or Vijay Singh Biggest Story to Kickstart Golf Season? Although the 2013 golf season has just begun, several stories are already making headlines, from Tiger Woods, Phil Mickelson wins to Vijay Singh's steroid use. Which story do golf fans really want to hear about? Unable to dial into the Golf Channel Media Conference Call yesterday, I was sent the transcript which started off with a very interesting question, namely, "what has been the most significant thing to kickstart the golf season and why?" Three experts that appear on Morning Drive were at hand to answer questions. Unfortunately for golf...and for Vijay Singh, the World Golf Hall of Famer was on the tip of the tongues of all three respondents; Gary Williams, John Cook and Brandel Chamblee, but it was Williams who mentioned that, with Singh's admission, that this is now a PGA Tour issue which means this could lead to suspension...not very good for Vijay who turns fifty this year. As for recent victories by Tiger Woods and Phil Mickelson, yes they are significant but, with the season just beginning, there's plenty of golf left to be played with fresh faces like Bill Haas and Nick Watney popping up each week near the top of the leaderboard or in the winners circle. "The fact that we've got them both (Woods, Mickelson) winning in the first five weeks of the year makes really the next several weeks leading into Match Play and beyond very exciting for all of us," mentioned Williams. 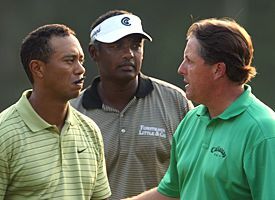 John Cook stated that, in addition to the stories of the tried and true golfers, younger U.S. players winning early in the golf season is reason to rejoice but Chamblee was quick to disagree commenting that "as long as Tiger Woods is playing golf, he'll hold our interest far above anything else." Do you agree that, as long as Tiger Woods is in the field and once again a winner that he will be the most talked about news item this year on the PGA Tour? Will fans stay tuned to golf if Woods falters and his season becomes a non-event? In honor of the PGA Tour Waste Management Phoenix Open tournament, Golf for Beginners has found this offbeat, environmentally friendly list of Golf Course Repurposes from RepurposedMaterialsInc.com, a company that re-uses industry waste and byproducts to be used in a completely different industry. Enjoy! 1. Advertising Billboards repurposed as Tarps for Equipment, Pond Liners, etc. See many more fun economically and environmentally-friendly ideas and materials for golf course and more at www.repurposedmaterialsinc.com.